This venison recipe is a tried and true favorite. 4 venison tenderloin steaks about 1 in thick, about 1.5 lbs. 2 medium green onions sliced, about 2 tbs. Mix wine and mustard until well blended. Separately mix water and burgundy wine marinade. Mix wine marinade with wine-mustard blend. 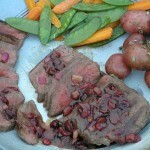 Place venison in resealable plastic food storage bag or shallow glass or plastic dish. Pour wine mixture over venison and turn to coat. Seal bag or cover dish and refrigerate for at least 2 hours but no longer than 4 hours. Turn venison occasionally. Remove venison from marinade, reserve marinade. Sprinkle venison with salt and pepper. Heat oil in 12 in. non-stick skillet over medium heat. Cook venison about 4 min. turning once, until brown. Add broth, reduce to low heat. Cover and cook about 10 min . turning venison once, until tender and desired doneness. DO not overcook or venison will become tough. Remove venison from skillet, keep warm. Stir marinade into skillet. Heat to boiling, scraping up bits from bottom of skillet. Reduce heat to medium. Cook about 5 mins. until mixture is slightly reduced, Stir in cranberries, jelly, butter and onions. Cook 1-2 min. stirring occasionally, until butter is melted and mixture is hot. Serve sauce with venison.